Summary Ralink based dual-band three-stream AP/Bridge/Repeater with impressive rate vs. range performance in both bands. It took awhile for ASUS to send the oddly-shaped little mate for its ever-popular RT-N66U "Dark Knight" router in for review. Given ASUS' penchant for incrementing its way toward firmware stability, I guess they wanted time to work out some of the initial kinks that early buyers paid for the privilege of wrestling with. At any rate, it's in, it's tested and I have to say I am impressed. The EA-N66 is a selectable dual-band three-stream N device that functions as a wireless Ethernet bridge (its default configuration), access point or "universal" repeater. 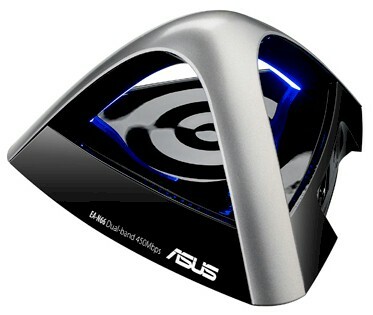 ASUS' choice of including "N900" in the product's name is misleading, however, since it implies simultaneous three-stream dual-band operation. It should more properly be called an "N450" product, which is the maximum link rate supported on either band when 40 MHz mode is used. Since you can't get a feel for how large the N66 is from the photos on its product page, I took the shot below with it parked in front of a Dark Knight. The adapter is large and heavy enough to not be dragged around by its attached power and Ethernet cords, but small enough to sit on top of a media center and not incur the wrath of too many decor-conscious significant others. If you want to wall or ceiling mount it, have at it using the tri-cornered screw slots on its bottom. The controls, ports and indicators are called out in the diagram below. As the product name implies, the Ethernet port is 10/100/1000. It doesn't support Power over Ethernet and you can't set its link speed or mode in the system settings. The photo below of the top of the N66's board is taken from the FCC docs (FCC ID MSQ-EAN66). This view has the tops of the RF cans removed to show additional RF components, which I suspect are 2.4 and 5 GHz power amplifiers. The grey square on the top left component is a thermal pad to couple the chip to the RF shield top for better heat removal. The bottom photo of the board shows the RF sections for the other band's radio, the RAM and Ethernet components.